Who can possibly teach what they cannot do? How can you explain it. So much is about imparting physical feelings. These are of the utmost subtlety, sometimes a matter of an adjustment of the smallest nature apparent only to a master. Moreover, it is a fact that for all instrumental playing the entire future possibility of accomplishment lies in the beginning, the foundation, because both technique, and musical thinking and understanding, are based on the variation of simple principles. The more perfect these underlying skills and concepts, the more possibility for mastery. Mastery is the ability to play without antagonism, either muscular or mental. Yet at a certain level of accomplishment the technique of all instruments becomes the same. With our approach, which is based on the idea that mastery is achieved through the perfection of fundamental musical and physical principles that are essentially the same for all instruments and singing, in theory a master of one instrument should be able to help a student of any instrument understand how mastery is to be achieved. For example, Chopin's piano teacher was a violinist. That did not seem to hold him back. Q: Does one need to be a virtuoso to be a great teacher? A: One needs to be a virtuoso of some instrument. A master player can see through the complexities of music. They are masters because they see simplicity within what appears to be difficulty. Most teachers teach what they were taught, they teach how they play. If a student thinks that is good enough, so be it. But I suspect that most serious students want to know how great players play. Since this is never seriously studied, teachers, in reality teach what they guess to be true about how to achieve expertise. They are even guessing further about what constitutes actual artistry since, in general, all musicians attribute skill they don't understand to the mysterious workings of talent. Q: Do you think that there is such thing as a student with no talent for an instrument? A: Learning an instrument is a combination of teacher skill, parental interest, and a student with an open mind. None of these conditions just happen, nor can a student just "do it." To find a skilled teacher is rare enough, to help a parent know enough about music to help a student's learning process is another hurdle, and to overcome the fear in everyone that they are incapable is the greatest gift a teacher can bestow on any student. Q: Do you think that there's such thing as a person with no sense of pulse? A: Not as long as they are alive. Q: What do you do to help a student who struggle with rhythm? A: Rhythm is innate. After all, without it we couldn't walk or talk. So one must separate the difficulty of learning rhythm as a conceptual understanding of what is printed on the page from the innate feeling that is in one's body. The two must be brought together. Q: You place a lot of emphasis upon technique in your teaching. Do you also encourage the students to play scales and other rote exercises? A: In reality technique and the ability to express oneself musically are inseparable. There is a common belief, particularly in the U.S., that there is such a thing as a performer who is an artist but does not possess great technique. That is impossible. Artistry can only be expressed through technique and any flaw in technique diminishes artistry and can be heard by the discerning listener. There are, however, performers who have technique and no artistry. In fact, they are quite common. Therefore, to prevent their propagation, I believe that nothing a student learns should be played without musical understanding and phrasing. Even so-called exercises are music. I encourage students to play everything musically. Nothing is played in a rote fashion. There should be thought behind every note. After all, many accompanying figures in pieces are repetitive and rather simple, not unlike etudes. But there is a way to play everything musically. Part of Chopin's approach to the piano was to have a student play a single note with as many as twenty variations. A great actor could say, "How are you?" in perhaps twenty different ways with twenty, or maybe even more, shades of meaning. A: Talent is the lazy mind's explanation for skill that seems inexplicable. Yet a close look at talents will show they are an amalgam of several circumstances fortuitously brought together - a supportive cultural milieu, interested or at least supportive parents, hard work, fine teaching, and a mind free enough to run with intuition. No "talent" just appears, although once they have become famous every effort is made to make it so appear. In reality, everyone has talent. Talent is a small blip of wonder compared to the miracle within everyone of being part of life. Can anyone explain how they grow? That is real talent that is inexplicable. Nearly every aspect of great playing is explainable. As a matter of fact we have spent the last twenty years analyzing the methodologies of some of the most unexplainable great masters of the past. I have spoken to many well-known and famous musicians about my theory that almost all aspects of talent and accomplishment are explainable and teachable. Inevitably their response has been, "Impossible. You're speaking of genius.!" And not once has anyone asked me to prove my point. They always move to another topic. I once asked a friend of mine, a famous player, if he could teach students to play the way he does. He responded, "I could. But I wouldn't." It is a very competitive field. But if the art is to survive and even thrive we must do more. Unfortunately, most performers and teachers can only teach the way they play, which even on a high level, is not enough. The responsibility of teaching goes beyond that. What if in biology everyone only taught what they had learned from someone else many years before? Why not examine and analyze how the very greatest players play and see if what they do can be understood and utilized. We--all teachers--have a responsibility to students, who, after all, have placed their trust in us. And that is that what we teach is not idiosyncratic, unprovable opinion. And that is why at the Institute we study great players. Our goal is to create a movement to raise the level of the average player to excellent thereby raising the general level of musical accomplishment. The level of mastery will thus become more commonplace generally, creating a concert going public that is more knowledgeable and truly engaged in the art as players themselves, composers, and auditors. Musical training is a science and an art. Q: What is a bel canto approach to instrumental mastery? A: Groves dictionary defines bel canto as fine singing. There is a great deal of argument over what the term means. But I will say how I employ the term. Some students learn more easily with an analytical approach, while others are more suited to a physical method. How do you adjust to these different learning styles? To have deep understanding one must look in many ways. Playing is a mind-body system. Q: Do you place much emphasis upon arm weight in bowing in your teaching? A: For all string instruments the weight of the right arm is, basically, down. From the "down" weight the sound is released by the spinning of the string. Too much down pressure will ruin the sound. In fact, the bow moves across the strings. A key ingredient of great tone is that the sound be released, not pressed, or forced. This applies to all instruments. Percussiveness destroys the musical line, the sound, and the athleticism. Q: Does the left hand play a key role in sound production? A: There are only two hands that can make the sound, and both are equally important. The left hand stops the string, shortens or lengthens it, thereby changing the pitch. The position of the fingers on the string is crucial to both the production of sound and intonation. A slight cushion must be formed at the tip of the finger. The fat of the finger creates a round sound. The pressure of the finger on the string affects the cleanliness of the tone, as does the angle of the bow to the bridge which must be 45 degrees, the wood turned away from the bridge. Q: How important is good posture? A: Without correct posture none of the muscles of the body work correctly and efficiently. Good posture is crucial for all athletic endeavor. Q: How important is a fine instrument? A: People often say that to a master it makes no difference what he plays on. Yet you will inevitably find that those same masters will spend every cent they have, sometimes millions of dollars for a great instrument, and hundreds of thousands for a great bow. The instrument and bow, in the case of string playing, make a huge difference. Fine instruments have nuances, color possibilities that stimulate the imagination. Fine bows are balanced beautifully, making string changes and articulation more subtle, or bringing tonal possibilities from the violin which until played by a great bow have lain dormant. Q: Some students are introverted, some are extroverted some more analytical, and some more intuitive. How do you, for example, bring out the personalities of the more introverted or analytical types? A: If one is concerned with expressing the music and can immerse oneself in that process, there is nothing to overcome. Q: Do you encourage your students to play in an orchestra while studying with you? A: I encourage students to play music with and for other people. Obviously, some of the greatest music ever written is orchestral and to experience that music fully one must play in an orchestra. The most unfortunate and worst aspect to orchestral playing is the encouragement of reliance for musical expression on the direction of a conductor, whose presence may be necessary to organize the students efforts and teach them the piece of music, but ultimately teaches them to play for his approval, thereby bypassing their direct interaction with one another and the music. In addition to this, a conductor's job is to beat the beats, ironically the very thing which is the destroyer of a musical line. Great music is written so that all the instruments involved interact and connect with one another, just as actors in a play. The musical lines feed in, weave around, and play off each other. The presence of the conductor interrupts this interplay between musicians because they must go through him to each other. It is as if the director of a play remained onstage and the actors could not look at each other, but first needed the approval of the director to see when and how to speak or move. The conductor, by his presence onstage in performance, interferes with spontaneity. Q: Do you think that students should learn to compose? A: Without a doubt, the divorce of composing and playing, which has must have started sometime in the early 1900s and reached complete separation by the 1930s has been the most destructive and unfortunate development for the art of music. This fact has had serious consequences for our entire conception of what music means. We have lost the creativity. And with this comes an exaggerated piety for the written score. Why is this a problem? The score at best can only be an approximation of a composer's conception, just as the written words of a play need to come to life by speech. Music is emotion. It is true that it is written by logic, but it is created, conceived, in an altogether different realm--inspiration. Inspiration knows nothing of dead perfectionism. For example let's consider rhythm. Rhythm is the pulse of music. Music is meant to be alive, vital. As such there must be an ebb and flow, as there is in speech. The rhythm of speech is inseparable from feeling. It is the conveyor of feeling, along with dynamic variation. These nuances can never be fully shown in a score. They must come from the direct intuition of the performer. And they may be different every concert. Additionally, we now have a situation because of non existence virtuoso performer-composers where performers have been elevated to a status musically that they don't deserve. No matter how wonderful the performer his accomplishment is on a secondary level to that of a composer of the rank of Strauss or Beethoven. Yet we now see the performer advertised as "such and such" plays Beethoven's "Emperor" Concerto with Beethoven appearing in small letters under the name of the soloist. This is the wrong relationship. Without the great composers even Heifetz, Horowitz, and Caruso would have been playing and singing in cafes for a living. Conductors would not exist. Also, we now have composers that are not only not virtuoso players, but are hardly able to play an instrument. They write music that is "theoretically" playable, but usually unfriendly to performers. The result is that no one wants to play these pieces. So, yes, all students should be able to compose something, just as all students are capable of writing a paragraph of words. How can you teach someone to write a novel of genius. You can't. But if someone has no knowledge of literature, no understanding of grammar, and no encouragement to be imaginative, it is unlikely that great writing will be born of him. The same is true with writing music. Composition and its necessary skills must be learned. With that basic knowledge some may be inspired to write something more involved, and some may be exceptional. The odds are greatly improved if more people have knowledge. Q: Do you tend to dictate musical interpretations? A: I teach them general principles within which they can find their own nuance. Q: How do you reveal the emotional depth of a work to a student who may not be able to relate to its emotional content due to lack of life experience or youth? A: Youth does not preclude emotional depth. In my experience it is the other way around. Adulthood and the need to please often kills our ability to feel. Q: Do you encourage your students to listen to recordings? A: Recordings allows us to have Horowitz play in our living rooms. Or on another night we may want to visit with Caruso. In France painters learn to paint by spending the day in the Louvre and copying. All learning of a skill is done through apprenticeship. 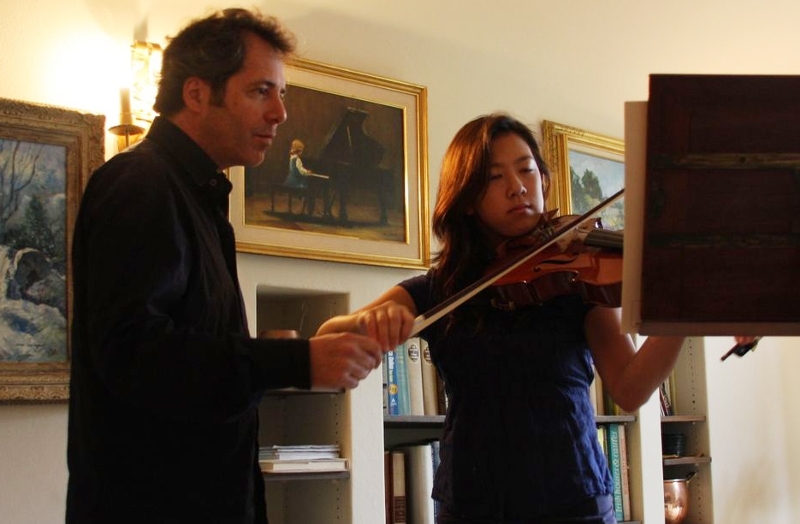 If a student could truly imitate Horowitz or Heifetz he would have to be a master. Q: What do you do when a child is forced to play an instrument by their parents? A: Children are forced to go to school, the point being to educate them. I am quite sure they would prefer to play video games and watch television all day. The condition of being forced is the interplay of parent with child. There are many ways to look at a child's disinclination to do something. Q: Do you think that the study of music is important developmentally for children? A: In school the subject matter that children study is overwhelmingly cerebral. For the most part they memorize facts, occasionally within careful circumscribed parameters practice critical thinking, and often engage in some form of sports. To play music on a high level requires, and makes conspicuously evident the fact, that our minds are inseparable from our bodies. Playing an instrument is a physical dance by the body around a musical instrument controlled by the brain in such a way that the utmost expression is released with the least possible physical antagonism, a free flow of mental/emotional energy. To accomplish this feat of coordination a student must develop an ability to see through apparent complexity to the simple underlying structure which is the foundation of the music. Music is essentially theme and variation, and no matter how seemingly complex, to the trained practitioner is ultimately found to be a building made of simple elements. Because of this combination of the mental and physical and the control and awareness required over both elements, yet allowing and encouraging emotional freedom, musical study must develop the brain more holistically than our traditional educational training ground. Q: Do you encourage students to go into the music profession? A: We teach the art of music, and any art has nothing to do with the practicalities of our lives, which is an unfortunate comment on our society. Art is the contemplation and expression of beauty, an aspect of life without which we are nothing but machines. Teaching an art is more than passing on a skill. Leonardo Da Vinci said that learning to draw is learning to see the world. Learning to understand and play music is confronting your physical, mental, and emotional limitations and attempting to go beyond them. To do that we have to see ourselves in ever expanding paradigms. This gradually helps us understand the world. It is this "seeing" that is the action that allows one to do. The seeing is the doing. So art is about perceiving what is true, although what is true is never static. To learn to play an instrument as a means to play in an orchestra or band is not learning music itself and seeing where that takes you. In fact, learning to understand music has no relationship to anything practical at all. Art is a way out of the practicalities which form the structure of our society. It is a doorway to a different world, which requires the direct perception of beauty.